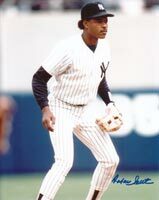 Today is the birthday of the player who got the first base hit in the original Yankee Stadium. His name was George Burns and he spent a large part of his life answering the question, “Which George Burns are you?” Back during the WWI era of MLB history there were two pretty good players using the same name as well as an up and coming Vaudeville performer who would later marry Gracie Allen and star with her in a popular TV show in the 1950’s. The National League George Burns played most of his career with the Giants as an outfielder and averaged a very impressive .287 during his 15-years in the Senior Circuit. 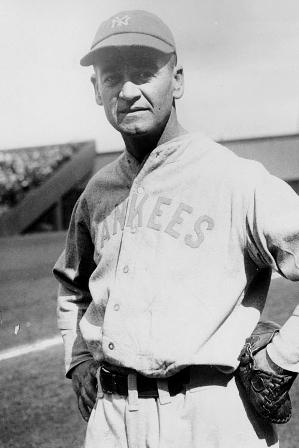 Then there was the American League George Burns, who averaged an even more robust .307 during his 16-year career in the Junior Circuit, which included brief appearances in a Yankee uniform at the very end of his playing career, during both the 1928 and ’29 seasons. The NL George Burns was a very good defensive outfielder. The AL George Burns was a horrible defensive player but because he hit from the left side and handled a bat real well, he never had a problem finding a team that wanted him. To help keep the two straight, sportswriters back in the day would refer to the AL George Burns by his nickname, “Tioga George.” He had lived in Tioga, Pennsylvania for quite a while. He put together some great seasons for the A’s, the Red Sox and the Indians, actually winning the AL MVP Award with Cleveland in 1925, when he set career highs in batting average (.356) and RBIs (112) while leading the league in both base hits (216) and doubles (64). On April 18, 1923, his single off of New York’s Bob Shawkey was the first official regular season hit recorded in the House that Ruth built. A few pitches later, Burns became the first runner ever thrown out attempting to steal a base in the new ballpark. In September of 1928, Burns had been put on waivers by the Tribe and Miller Huggins told Yankee exec Ed Barrow to pick him up. The Yankee skipper wanted Burns on his bench for those times that called for a skilled left handed hitter. Burns, however, wasn’t sure he wanted to come to the Bronx and he refused to report until he had a chance to talk to Huggins to make sure it was not just an end-of-the-year and then you’re gone sort of deal. When Huggins assured him there’d be a spot for him on the team in 1929 as well, Burns made the move put on the pinstripes. He was then used exclusively as a pinch-hitter and though he did start the ’29 season on the Yankee roster as Huggins had promised, he was sold back to the A’s that June. That suited Burns just fine because by then he made his home in Philly. He retired following that season and became a coach and manager in the Pacific Coast League following his playing career. Burns shares his birthday with this one-time Yankee prospect, this former Yankee reliever and this one-time Yankee shortstop. My first thought when I saw Melky Mesa head back to third base after missing the bag when he attempted to score the winning run in his very first appearance as a Yankee was that he would never get a second appearance in pinstripes. Today’s birthday boy had been sent in to run for third baseman Eric Chavez, who had singled to lead off the bottom of the 14th inning in a huge game versus the A’s on September 22nd of the 2012 season. At the time, New York held a precarious on-game lead over the pesky Baltimore Orioles in the AL East Division race and every was critical. Fortunately for him and the Yankees, Mesa finally scored the winning run with two outs on an error by Oakland first baseman, Brandon Moss and the Yankees went on to win the AL East race too. Nine days later, Mesa got his first big league hit and first RBI in a pinch-hitting role against the Red Sox. There’s an outside chance that Yankee fans will be seeing a lot more of Melky in 2013. New York needs to replace Andruw Jones as the team’s right-handed DH and Mesa will be given a shot to win that role in spring training. Since signing with the Yankees as an amateur free agent, this native Dominican has spent the past seven seasons in New York’s farm system. Although he’s averaged just .244 during that time he’s got decent power, great speed on the base paths and is a solid defensive outfielder. 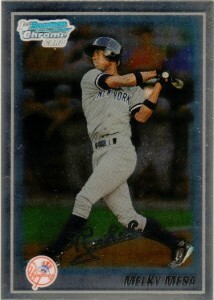 He hit 23 home runs playing for both Trenton and Scranton in 2012. Mesa shares his January 31st birthday with this former Yankee reliever, this long-ago outfielder and this one-time Yankee shortstop. 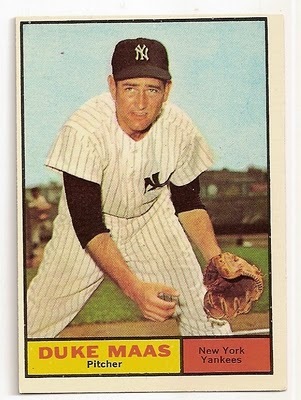 If the Yankees had won the 1959 pennant, Duke Maas would probably be a much more recognizable name for New York’s baby-boomer aged fans. That was the season the veteran right-hander from Utica, MI finished 14-8 for Manager Casey Stengel’s disappointing third place team. The Yankees had acquired Maas from Kansas City during the 1958 season in exchange for Bob Grim and Harry “Suitcase” Simpson. Duke had a great start in pinstripes, winning 7 of 10 decisions to help New York win the 1958 pennant. He got shelled in his only appearance against the Braves in the World Series that year but bounced back to become one of the team’s few bright spots the following season. He had another strong year in 1960, going 5-1 with 4 saves as the Yankees recaptured the AL flag. Loaded with pitching, New York left Maas unprotected in the 1961 AL Expansion draft and he was taken by the Angels. LA then traded Duke back to New York before the start of the ’61 season. After just one appearance that year, Duke’s arm gave out and he never again pitched in the big leagues. Duke died at the very young age of 47, in 1976. This former Yankee and Met shortstop, this long ago outfielder and this current Yankee prospect were also born on the last day of January. If you asked most Yankee fans if the shortstop Rafael Santana played for the Yankees their likely response would be, “No, he played for the Mets.” That’s because the native of the Dominican Republic did spend the vast majority of his six-season big league career with the Amazin’s and he was the starting shortstop on their 1986 World Championship team. What most of us forget is that the Yankees traded for Santana before the 1988 spring training season and he became the team’s starting shortstop for then Manager, Billy Martin. Martin, as usual got fired during the 1988 season and was replaced by Lou Piniella, who stuck with Santana at short for the rest of that year. Rafael hit just .240 for that season and his on base percentage was a putrid .289. He also played very mediocre defense. He then suffered an elbow injury that caused him to miss the entire 1989 season, making it an even easier decision for the Yankee front-office to release him when his contract expired at the end of that year. That explains why Yankee fans have a hard time remembering Santana played in pinstripes. This hardly remembered but very effective Yankee pitcher from the late 1950s, this long ago outfielder and this more recent Yankee outfielder prospect were all also born on January 31.